Machiko (Machiko Ono) just started working at an old folks home. It's a difficult job dealing with the old, day in and day out. With the physical and emotional stress, she is not sure if she is cut out for the job. The older, wiser co-worker (Makiko Watanabe) tells her, "There are no formal rules, you know?" That comment not only applies to their profession, but also the main theme of the film - coping with the loss of the loved ones. Machiko connects with one of the elders, Shigeki-san (Shigeki Uda), who's been mourning his wife's death for 33 years. 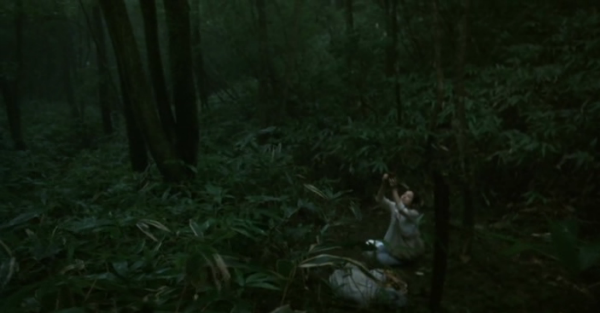 It is hinted that Machiko is grieving too; the death of her young son. According to the Buddhist monk who's giving a philosophical pep talk about death to the old folks at the center, it is the 33rd year that the soul of the deceased moves on to another realm, never to return. After celebrating Shigeki's birthday, Machiko and Shigeki take a trip to the mountains. And the simple day trip turns into an overnight stay deep in the forest where they share their common loss. Naomi Kawase, yet another great Japanese documentarian-turned-narrative filmmaker, combines documentary sensibility and naturalism to her filmmaking (while watching Mourning Forest, I couldn't stop thinking about fellow Japanese documentarian/filmmaker Hirokazu Koreeda's Maborosi). With such maturity and simplicity, Kawase presents two different people in mourning in the most understated yet beautiful manner. I haven't cried this much since god knows when.